Who likes food trucks and free family fun? 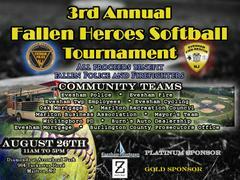 Join us this Today, Sunday, August 26th, from 11am til 5pm, at the 3rd Annual Fallen Heroes Softball Tournament at the Diamonds at Arrowhead Park. Food Trucks, Chickie’s & Pete’s, Donkey’s Steaks, Maddie G Dogs, Mary’s Diner & Mr. Softee. Come hungry, leave happy! Hope to see you all Sunday, money raised benefits local fallen police officers and firemen.